I'm sad about that. Sad for Cliffy a little but mostly sad Radical Heights won't be developed. I like it. It just isn't optimized worth a crap so my old computer can't play it well. Otherwise I would be playing it a lot. I heard mention they would leave the servers up for awhile but I'm not sure how long. I'm guessing not long. 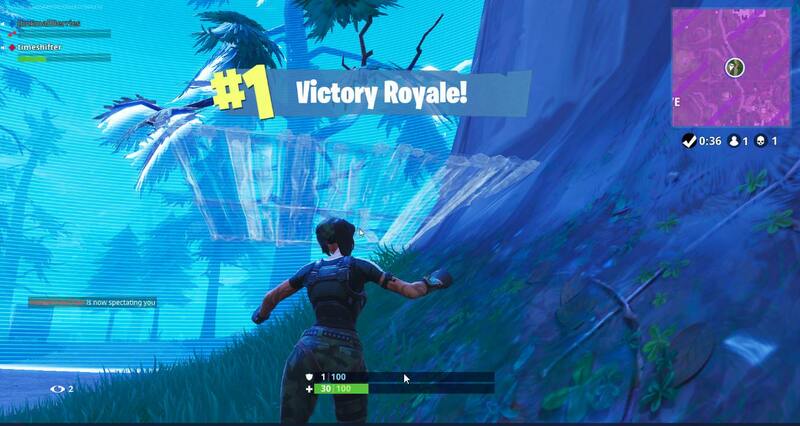 JohnSmallBerries and I got a Duo win last night! 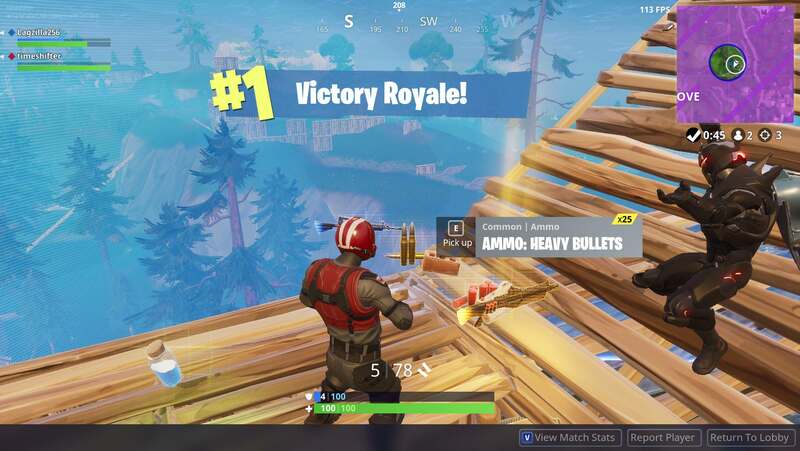 He had the winning kill after a well placed RPG knocked the guy off of his high ground. What happens when you climb a tall ramp and dance like an idiot! Anyone tried Realm Royale yet? I played just one match so far. Got killed immediately. I might end up hating it but I'm gonna give it a try more tonight. It's free. Would love to have a teammate since there is no solo. My Steam profile name is Binger. Not sure if you can find me with that or if you need my account name let me know. It's only 5gb so only takes a few minutes to download. Seems to run well enough on my lowly GT640, which is below minimum requirements for game. I only played for a minute or so though so I will have to see how well it does in battle. It's only 5gb so only takes a few minutes to download. Statements like that make me feel old! They keep tweaking Fortnite. Latest change in nerfing the pump shotguns a little bit, something the elites don't like, but it makes the game a little more even and fun for the 90% who aren't pros. Right now there's a blitz mode. Games only last 15 minutes instead of up to 22. Starts out with a storm circle ready to close and quicker storms. Might be more fun for those who complain that they mine materials and loot forever and die at first sign of action. You get right into the action. I like the mode. And, there's a practice mode coming soon. Lots of materials and loot, team damage and you RESPAWN. I guess it'll be more like deathmatch than battle royale. Finally, just saw a story about "president" or VIP game mode. It's an unofficial game mode. Basically a bunch of people queue up and one player is the president. He doesn't carry any weapons. It's everyone else's job to protect him. Stop wasting hours cutting woods, and just build, build and build! This is the fastest way to become a PRO! Here's a clip of the replay. Laggy, check out how the guy knocked his teammate down !! Right now is a great time to try Fortnite. They've just released a limited time mode called Playground. It addresses one of the biggest complaints of new players - there's no training or practice mode. You can play by yourself or with a total of 4 players. You get one hour and the whole world to yourself. If you die you respawn. Friendly fire is on, so you can fight other teammates. There is an abundance of resources, when you mine them you get about 10x what you'd normally get, so it only takes a few seconds to get a ton of wood, stone and metal. A good way to practice building or build fights. Also, every place there's a possible chest spawn will have a chest. There are treasure chests throughout the map. They always spawn in the same locations, but you never know if it will be in your favorite spot or not. But in Playground, if it can have a chest it will have one. One thing is a blast - ride a shopping cart down the mountain. Just to the west and slightly south of Tilted Towers are some shopping carts and ramps on the top of a small mountain. Way cool. What do you guys think about the guided missiles making a comeback? I'm not too crazy about them, personally. I've yet to encounter one since they came back. I think I heard one once, but that's it. My understanding is that they're much more limited now, harder to turn, etc. They are pretty nerf'd. I don't care for them though. It breaks the feeling of the game pretty hard. I watched a video of this game...glitchy, choppy, not for me. Have fun with it for those that like it. It is literally not ever choppy, and has almost no glitches.